Here at Lattice, we’re passionate about improving the efficiency of sales and marketing programs. One of the ways we did this last year was to bring self-service modeling and real-time scoring to market, unlocking a new level of operational efficiencies for our customers and establishing a new standard for predictive operationalization. When marketers want to analyze personas of US and EU buyers, they don't have to engage with Lattice right away, although our customer team is always available to help. With self-service modeling, they can do it themselves, and determine the right kinds of campaigns to run for specific segments of customer and prospects. The ability to test a model and immediately put it into action by scoring leads in real time, adding data enrichments from Lattice and then launching the relevant campaign insights into a CRM or marketing automation platform saves marketers valuable time. The automated workflows we’ve established support our self-service modeling capability, and create a seamless predictive process for our customers. Today we are excited to launch yet another innovation, automated remodeling, which unlocks the next-level of operational efficiencies for our customers. With our self-service platform, marketing and sales teams were able to create as many different models as they needed, such as lead and account modes, product models and more. 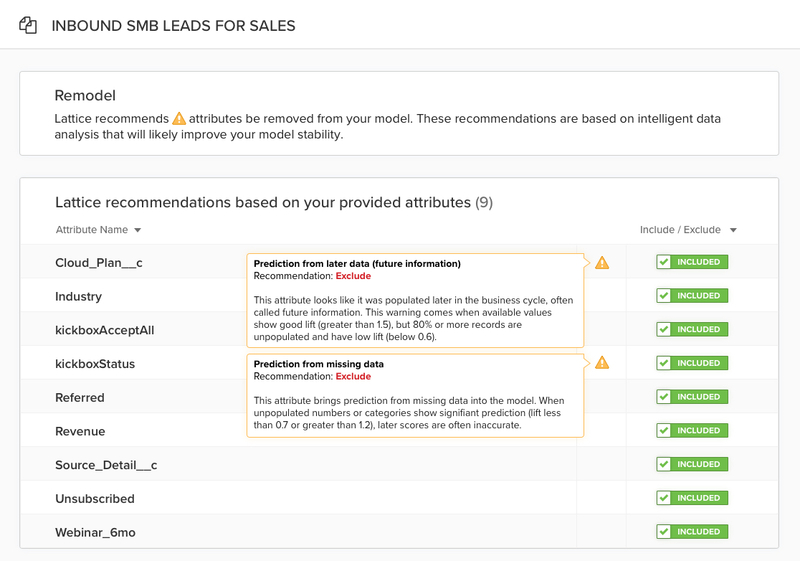 However, with this shift we found some customers were spinning their wheels as they needed to review their predictive attributes with data science teams in order to refine the models they built. Predictive attributes often require review because they may adversely impact score quality if they are sparsely populated, have too many discrete values or have future information. The process of detecting and eliminating these attributes can be time consuming, because it requires interlock between data science and marketing teams. Data science teams would run manual analyses and identify candidates that could have adverse impact, and then marketing teams applied business context to determine which attributes to include or exclude. We realized this process could limit the number of predictive models our customers could put into action, and built automated remodeling to simply their workflow. How does Automated Remodeling Work? With this new feature, the Lattice platform automatically profiles the training data and identifies attributes that could have an adverse impact on prediction accuracy. In the example below, you can see the platform has identified two attributes that could have an adverse effect on the score accuracy. Marketers can now simply review these attributes and make a decision to include or exclude these attributes with click of a button. Once all attributes are reviewed, users simply click Remodel and the platform rebuilds the model within matter of minutes. 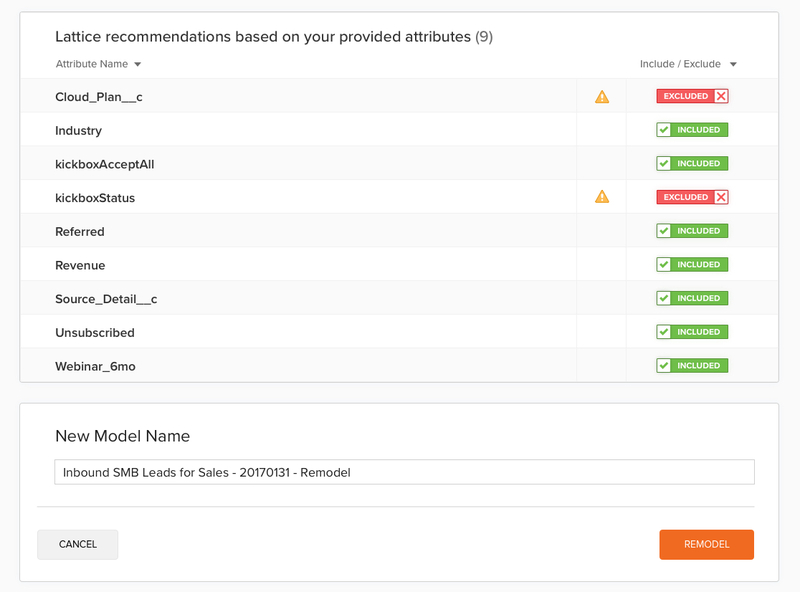 Now the entire process of reviewing predictive attributes and refining models is quick and automated. If you are a Lattice customer, we would love to have you try automated remodeling workflow and give us your feedback! Contact us at product@lattice-engines.com. If you are not a customer and would love to learn more about our platform, reach out today to get started!